Defeat a climate denier to save the world! Loot the Froot as it falls to the ground, but beware of the blocks! How long can you last selling stocks? Tick-Tock. Your friends go in the box. Perfect the art of making Jam! Race to beat the darkness from consuming you! Knock your opponents off the ledge and become the grand champion! This game is insanely fun for how simple it is. If you ever want to know what it is like to work in a kitchen, or food cart, check this game out! I really enjoy the frantic nature of seeing customers line up waiting for their order and having to prioritize what is being prepared to best serve your customers. I played v0.3 and v0.4 and the tutorial has improved a lot! I learned more things the second time I played it that helped me be more efficient in the kitchen. Only criticism so far is that my hand gets tired when playing, and that makes it hard to progress through the mission of getting a more diverse menu. Overall, super fun game that I can see going places. Great work! Just wanted to share if you missed my stream playing all of the submitted games, you can watch here. The video shows the times I played each game by user handle of each game. Hope you enjoy watching as much as I did playing! Such a fun game! Nice work! I'd like to see more songs, but the one you picked was a great intro. GDQ One Mechanic Game Jam 5 community · Created a new topic That's a wrap! Thank you all for participating in the One Mechanic Game Jam 5. Whether you finished a game or not, we are proud of you for putting in the effort. Making games is hard! But you are now a little more knowledgeable for the next game you make. Keep at it friends! Make sure you play/rate/review some of the games that were submitted. It's really important to support each other! We plan on having the next OMGJam in a couple of months. Keep a look out for it and hop in our discord server while you wait! GDQ One Mechanic Game Jam 5 community · Replied to Lykaiast in One week until the jam starts! Themes will be announced tonight (PST). I'll update the main page when they are ready. GDQ One Mechanic Game Jam 5 community · Created a new topic One week until the jam starts! Hey all you game devs! We have one week until omgjam5 begins! I wanted to remind you all to start preparing for the jam. Get your tools ready, make sure you have scheduled enough time to complete the jam and have communicated with your loved ones about your commitment, and, if you need a team but don't have one, let us know either on the community page on itch or on our discord. Also, if you wouldn't mind, please spread the word about the jam. Tell your friends about it, tweet about it, whatever you can to get more people involved. It makes it more fun if there is a lot of games being made. Please share the link https://bit.ly/omgjam5. And lastly, we are looking for participants to stream their play throughs of the submitted games on twitch. If you are interested, please submit your twitch channel link either on the community page or our discord server and let us know when you'll be streaming. This is a great way to interact with the developers of the games, and a great opportunity to get more followers! Thank you to anyone who is interested. We are really excited for the jam to start, and hope you are too! See you in a week. Thanks for the feedback! Glad you like the art. If I had more time I would have tweaked the difficulty a bit more than I did. Something I'll keep working on. Thanks for playing! That was a fun video, you got the hang of it pretty well! Here is the VOD for the stream in case you missed it! Thanks again everyon! Any chance you have a windows build for this so we can play it on stream? Thanks! There were a bunch of people submitting right towards midnight and we have seen several games not make it into the jam. If you need help, please hop onto our discord server and let us know. We can help you get your game linked to the jam! Sorry we are a bit late on this, we were jamming hard! In the FAQ section it mentions that you can do any combination of the themes or none at all. Hope that jam went well! We will be streaming our playthrough of all the submitted games tomorrow, Monday July 2nd, at 1pm PDT on my stream, https://www.twitch.tv/7aylord/. But, if you can't make it, there will be a VOD that will be available after the stream. Thanks to everyone who has participated, and good luck on the final hours of the jam! GDQ One Mechanic Game Jam 4 community · Created a new topic Less than a week away! Just wanted to thank you all for joining OMGJam4! We are really looking forward to this and hope you are too! Try to spend some time this week getting all of your tools installed and ready, refresh your memory on how they work, and make sure to get enough rest. If you need anything during the jam, feel free to write a post in the community here on itch, or head over to our discord server! And if you have any friends who you think might be interested, send them over to the jam page at bit.ly/omgjam4! Can't wait to see what you all make! Hi Penduin! Yes! We will have a video up on your twitch and youtube channel soon! There is currently a premiere of the video on twitch happening right now! But after that is done playing, you can view it at any time! Here's the link: to twitch: https://www.twitch.tv/gamedevsquest. I'll post a link to the youtube channel later as well! First of all, thank you to everyone who was a part of OMGJam 3! Whether or not you finished a game, we appreciate you signing up, and we hope you learned something and had a good time! There will be more OMGJams and we hope you will participate again! We wanted to let you know that we will be streaming all of the submitted games for OMGJam3 tomorrow night starting at 7pm PST. This is the earliest time we could schedule after the jam has finished. But have no fear! If you can't make the stream, we will have a recording available! Tune in at https://www.twitch.tv/gamedevsquest tomorrow night where we will play your game and give you some feedback. GDQ One Mechanic Game Jam 3 community · Posted in Progress Update! That counts! And you don't necessarily have to go by a theme, so it's all good either way! 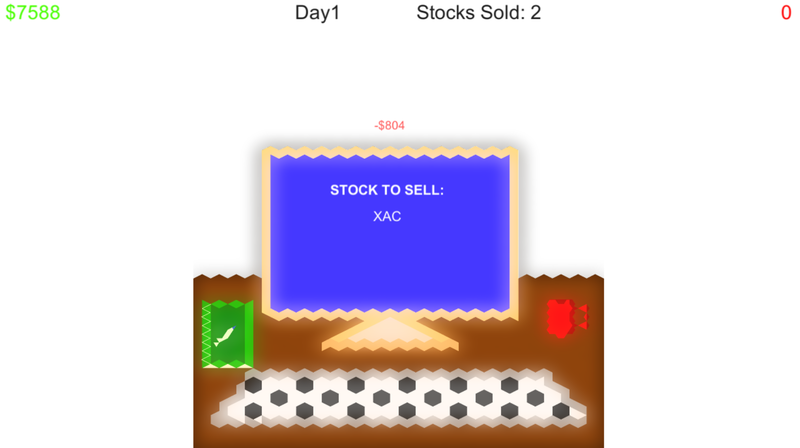 You basically have to type in the name of the stock without messing up and before the time runs out, otherwise you lose money. Looking forward to seeing everyone's games! GDQ One Mechanic Game Jam 3 community · Created a new topic Share your stream URLs with us! If you plan on streaming your work on the One Mechanic Game Jam, submit your links here or on the discord and use #OMGJam in your stream title! We would love to see your progress in real time. Hope everyone enjoys the jam, and good luck! Your music sounds great! If you aren't on the discord server, I highly recommend it (bit.ly/gdqdiscord)! If that's not your thing, no worries, I'll mention that you are looking to team up on there and see if someone is interested. Thanks for joining the jam! GDQ One Mechanic Game Jam 3 community · Created a new topic Need a team? Crowdforge- we have a jam page set up at https://crowdforge.io/jams/omgjam3 . You can use this site to help meet up with other developers that are looking for teams. You can also set your skillset and what skills you are looking for in other developers. It is really a great way to forge a team! We hope everyone gets a chance to work on the jam and are looking forward to seeing your games! Hey everyone! We will be streaming our play through of every OMGJam game on October 27th, at 10am PST. If you can't make the stream, we will be recording it and posting it to our twitch channel www.twitch.tv/gamedevsquest so you can still watch it. Can't wait to play all of your games on stream and share our feedback with you guys! Thanks crunchlaw! Glad you participated again and really liked your game! Nice! I love that there are bosses and power ups. Feels like a full blown game! Haha those voices are hilarious! Love the style and feel of it. I'm pretty bad though =( Thanks for submitting your game to the OMGJam! Haha I agree, the pun is great! Thanks 72Milk for the great game! This game is awesome. Great job at capturing that old school, one mechanic feel! Wow, this is a beautiful game! Good work and thanks for being part of the OMG Jam! Cool idea! Thanks for being part of the OMG Jam!